1962? Scientists work in a thermonuclear power plant, and Naval men watch the detonation of a thermonuclear device. The Apache nuclear test shot explodes into a mushroom cloud in the Pacific Proving Grounds during Operation Redwing. Aerial Megapolis Nuclear Bomb Impact Simulating a thermonuclear strike mass destruction ,against a huge megapolis aerial view, causing total termination of the city. 1956 - Floating instrument stations and a land station and an aircraft are shown as well as an atomic mushroom cloud during Operation Redwing. 1956 - Land stations have been outfitted with collection instruments to study nuclear fallout during Operation Redwing. 1956 - Scorched vegetation is surveyed in the aftermath of a nuclear test at the Pacific Proving Grounds. 1956 - The Cherokee shot explodes into a nuclear mushroom cloud and an aircraft and ship and a summary report are shown during Operation Redwing. 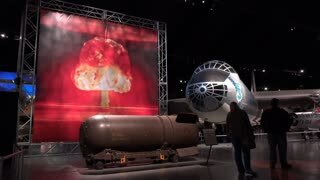 1956 - A nuclear mushroom cloud and aerial photographs are shown as well as animated distance stations detecting an electromagnetic pulse during Operation Redwing. 1956 - A Boeing B-47 Stratojet, Martin B-57 Canberra and a McDonnell F-101 Voodoo aircraft are inspected following nuclear tests conducted during Operation Redwing. 1956 - Atomic scientists coordinate in a central control center aboard the USS Estes during Operation Redwing. 1956 - A Lockheed P-2 Neptune aircraft is outfitted with a radiation detector and water samples are taken aboard an oceanographic survey vessel during Operation Redwing. 1956 - Nuclear explosions are shown and a Martin B-57 Canberra aircraft penetrates the stem and base of a mushroom cloud during Operation Redwing. 1956 - Single-stage rockets with detection units are launched into a nuclear mushroom cloud and data is received in a recording station during Operation Redwing. 1956 - Monkeys and rabbits are exposed to nuclear explosions to study biomedical effects during Operation Redwing. 1956 - Effects aircraft take off from an airfield to study nuclear tests during Operation Redwing. 1956 - A crater is shown as well as an animation illustrating the Zuni and Lacrosse nuclear weapons tests at the Pacific Proving Grounds. 1956 - Instruments are readied and a nuclear explosion damages an industrial building during Operation Redwing. 1956 - Damaged industrial buildings are shown in the aftermath of nuclear tests undertaken during Operation Redwing at the Pacific Proving Grounds. 1956 - An industrial building is destroyed by the blast-wave of a nuclear explosion during Operation Teapot. 1956 - Ground electronic positioning systems are used as well as effects aircraft as the Zuni shot explodes into an atomic mushroom cloud during Operation Redwing. 1956 - Stations are set up to record drag force measurements on the island of Yvonne during nuclear tests at the Pacific Proving Grounds. 1956 - Blast effects are observed on a Boeing B-47 Stratojet and a Boeing B-52 Stratofortress aircraft following nuclear tests conducted during Operation Redwing. 1956 - Smoke rockets are readied and telemetering blast pressure canisters are loaded onto a Convair B-36 Peacemaker strategic bomber during Operation Redwing. 1956 - A lagoon at the Bikini Atoll to be used for the Navajo hydrogen bomb test is shown during Operation Redwing. 1956 - An animated map is shown and the Cherokee nuclear bomb explodes into a mushroom cloud during Operation Redwing. 1956 - Scorched jeeps are shown on the island of Yvonne in the wake of nuclear tests at the Enewetak Atoll. 1956 - The mushroom cloud of a nuclear explosion is shown at the Pacific Proving Grounds during Operation Redwing. 1952 - Construction is began on Enewetak Atoll for atomic testing in Operation Greenhouse. The civil defense director hears updates from department heads at an operations center in anticipation of an atomic attack on Portland, Oregon. A nuclear device explodes into a mushroom cloud and a missile is launched, an artillery piece is fired and a depth charge detonates at sea. A Boeing B-52 Stratofortress aircraft is shown in flight and the bomb bay doors open during Operation Redwing. A rear admiral hosts a multimedia presentation to do with nuclear test detonations conducted during Operation Redwing. A rear admiral hosts a multimedia presentation and points to an illustration of nuclear explosions on the Eniwetok and Bikini atolls as well as a map designating a danger area during Operation Redwing. A fighter is flown as well as a bomber and a missile is launched and thermonuclear devices and fission weapons are displayed. A nuclear drive explodes into a mushroom cloud and a rear admiral discusses costs as well as the tasks forces involved in Operation Redwing. The Convair B-58 Hustler, F-100 Super Sabre, Boeing B-47 Stratojet and X-15 aircraft are all shown as well as the Karman line and an atomic bomb blast. A scientist describes the process by which thermonuclear burning changes hydrogen to helium in the sun as well as fusion research. 1952 - A helicopter flies over a crater following the destruction of the island of Elugelab in a test of a hydrogen bomb at the Enewetak Atoll during Operation Ivy.